I have made these muffins a few times recently. They are very simple to make, cheap and great for using up over ripe bananas. I still like to bake treats even though I am watching what I eat. We all prefer homemade cakes and treats so I can't really punish the family just because I am cutting down. Just because I have baked them, doesn't mean I have to eat them (all!). So I just have one with a cuppa and count it in. I am putting all my recipes on Sparkpeople so I can add them to my day easily. I use Sparkpeople to log my food daily, it helps keep me in check! These Muffins are approx 150 calories each. If I have one for breakfast I have a yogurt too or some fruit. mash bananas in a bowl and mix in the sugar, oil. eggs and milk. sift in the flour, baking powder, oats and nutmeg. leave to cool in tray and then tranfer to airtight container. I am going to freeze a couple out of my latest batch and I will update this to let you know how well they freeze. Preheat the oven to 170 c /325f / gas mark 3. In a large ovenproof dish, arrange alternative layers of potatoes and onions. Melt butter in a small pan and stir in flour. 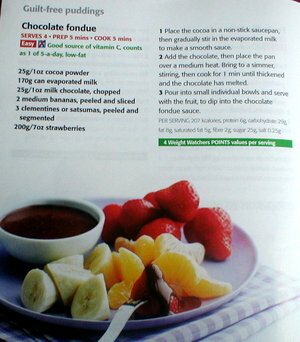 Cook, stirring for 1 minute and then gradually add milk until you have a smooth sauce. Whisk in the mascarpone and seasoning and poor evenly over the potato and onion slices. Sprinkle with ground nutmeg. Cover the dish with a piece of lightly oiled foil, bake for 1 hour, remove foil and cook for a further 30 minutes, until golden and crispy. Verdict - I served it with roast chicken and veg but it would go well with bacon or gammon. The family all loved this and have asked for it again but if I'm honest, I found it a bit rich and I think I would have preferred it without the mascarpone. Just a simple white sauce would have been better. CharlieP made the resolution to make a new recipe every week and end up with 52 new recipes at the end of the year. Seeing as I love cooking, am always threatening to try new recipes and have zillions of cook books, I thought, like a few others, I might join in. Verdict - super-easy to make, very yummy, everyone loved it and I have been told I must make it again this weekend! Woohoo - it's half-term and I have been busy getting my jobs finished and packing lots of winter woollies. I am heading out to the caravan very early tomorrow morning and am so looking forward to the break, even if it is going to be cold. We are planning to visit Scarborough and Hull for a spot of Christmas shopping and of course, lunch! A couple of evenings in the cosy pub will be on the agenda, as well as lots of beach walking, wrapped up warmly with scarves and gloves I expect. I baked these lovely apple muffins that Ali shared the recipe for - they are totally delish and surprisingly easy to make. I didn't have any blackberries so I just used a little extra apple. I haven't made muffins before, I usually just make cupcakes but I now want to experiment with different flavourings because these were so good. I made them cupcake size too, just perfect to warm us up with a mug of hot chocolate. Yum. I spent Saturday cleaning and catching up with the laundry, how exciting. That will teach me to spend half the summer by the sea. Playing catch up is worth it though. Back to the coast Monday morning until Friday teatime. The caravan is always spotless but the house is always a mess. I have been a bit fed up though because the boiler in the house is broken so we haven't got any hot water. The plummer can't fix it until next week so we are visiting family for showers and boiling kettle after kettle of water for everything else. It makes my wonder how they ever managed in days gone by! Plus it is going to be expensive, it looks like we could possibily need a new boiler. Bang go our savings! Oh well. I thought I'd treat us to some scones for tea to cheer us up, baking is a great stress buster. Here is the recipe I used, so simple and delicious (Jane Hornby's recipe from Good Food Magazine) - I followed the recipe exactly, the only thing I changed was that I made smaller ones so that gave 16 in total. Make a well in the dry mix, then add the liquid and combine it quickly with a cutlery knife - it will seem pretty wet at first. Scatter some flour onto the work surface and tip the dough out. Dredge the dough and your hands with a little more flour, then fold the dough over 2-3 times until it's a little smoother. Pat into a round about 4cm deep. Take a 5cm cutter (smooth-edged cutters tend to cut more cleanly, giving a better rise) and dip it into some flour. Plunge into the dough, then repeat until you have four scones. By this point you'll probably need to press what's left of the dough back into a round to cut out another four. Brush the tops with beaten egg, then carefully place onto the hot baking tray. If freezing, freeze once cool. Defrost, then put in a low oven (about 160C/fan140C/gas 3) for a few mins to refresh. Friday can not come around soon enough for me. I have been mega busy lately. Work has been and still is crazy. No time to blog, read or comment - I apologise! (plus we are no longer allowed online at work during lunch - what a cheek!) Of course it will all change on Friday when I have 6 glorious weeks off - yippee! So after I have spent the first 10 days at the caravan, I will then be back home for 4 days and then 4 days back at the caravan, right up until the end of the holidays. I am so excited because I really need the break! I haven't even had time to write my 'to do' list, let alone tick anything off it! But it will include lots of cliff top walking, BBQs and picnics (cross your fingers for some sunny days!) plus watching Big Brother and also catching up with hours and hours of TV i've recorded yet haven't had a minute to watch. One programme I'm looking forward to is BBC2's Chinese Food Made Easy. I love Chinese Food and want to learn to make it myself so it will be cheaper and healthier. One of the things on my 'to do list' is to cook some different meals for the family and try some new recipes. Last night I made this, a recipe I have made before but not for a long time. It is a very simple, fast and economical meal. Tagliatelle - I used one packet of fresh tag but you can use dried or even make your own. fry the bacon for five minutes until browned and then add garlic, fry for another few minutes and set aside. Drain pasta and return to pan, add the bacon, mix and then add the cheese mixture, mix well over a very low heat for a couple of minutes. It's very tasty - we had salad and a bit of garlic bread with it. Goes very well with a nice glass of wine! I must make it more often. My son also ate the leftover portion for his lunch today. It is really windy today. I went out for a walk and was nearly blown into the middle of the road! Good job I have plenty of weight to hold me down -lol! Speaking of which, I weighed in today and am down another pound. I am happy to settle of a pound or two a week now. I have been drinking lots of water and walking everywhere. Feeling much better for it too. I've had to cut out drinking copious amounts of tea in the late evenings though as I couldn't sleep due to caffeine overload! I will have to buy some Tetley Decaf or try some herbal teas instead! My family are starting to whinge about lack of baked goodies - so I suppose now they have had a month healthy eating I will have to make something today. I've found a recipe for chocolate coconut squares that I'd like to try and I will have to make the recipe below for myself to help me resist the bad stuff!